What are the benefits of refinancing car loan and are there any costs involved? 1.) The benefit of refinancing your car loan is to be able to enjoy low monthly installments, thus it will help you save hundreds to ten over thousands of dollars per year, depending on the car loan amount. The other benefit is to be able to “encash” some money, subject to car loan approval. 2.) Yes, there is legal fee involve. Do you provide refinancing of car loan? Yes, we provide car loan refinancing service. Through this, we help car owners to refinance their current car interest rate to a much lower rate. Why choose Speed Credit for your car financing needs? The check list is long when it comes to purchasing new or pre-owned cars. This is why many car buyers or even car dealers turn to our professional car financing services to verify the rightful car ownership and to ascertain the outstanding balance own by the car seller to the bank. What’s also good about our car financing service is that car sellers also benefit from this program as the car resale process is more convenient and time-efficient. Moreover, we will stand as a third party to assure the car seller that the car buyer’s loan have been approved, thus giving the car seller the confidence that the car buyer is genuine & have the means to buy his car. What are the documents need for COE Renewal Loan? Please visit https://www.usedcarloan.com.sg/car-financing/coe-renewal-car-loan/ for a complete list of our COE Renewal Loan requirements. Do you do COE Renewal Loan? Yes, we specialize in COE Renewal Loan. Click here to know more. What does your Car Loan Matching Service comprise of? Best used loan packages that perfectly would match your financial needs. Cheapest car loan rates in Singapore from our 13 bank partners. Prompt submission of used car loan applications. Verification of seller’s car ownership and outstanding balance to the bank (if any). Car sellers are assured that their buyer’s car financing is taken care by our finance specialists, thus will help avoid any unnecessary delays on the selling process. Our fastest approval time is within one working day (provided that all requirements and details were given accordingly.) This would help dramatically by reducing the potential fluctuations which may affect the selling price should the loan be rejected. We will act as a third party to assure the car seller that the car buyer’s loan have been approved, thus the car seller is assured the car buyer is genuine & have the capacity to buy his car. We will help you complete all your vehicle and finance transactions – From car loan application, full settlement of the vehicle, insurance & transfer of ownership. Who will find the Car Loan Matching Program Useful? All car buyers and car sellers will find our car loan matching program useful. What is the difference between bank car financing & in-house car loan? Bank Car Financing means getting a car loan through a certain local bank in Singapore. While In-house Car Loan means getting a car loan through Speed Credit which entails a more flexible & faster loan process. Our In-House Car Loan is perfect for those who may have some past credit issues but are financially eligible to finance their dream car. Does Speed Credit finance only specific makes of vehicle? No. Speed Credit can finance all types of vehicle, from private to commercial. How much interest am I likely to pay? Your car loan interest rate depends on the agreed rate between you and Speed Credit, which is subject to our bank partner’s approval. As of this writing, our cheapest interest rate is 1.68%. How can I check the status of my application or documentation requirements? What happens next after my application has been approved? Once you loan application has been approved, our car finance specialist will contact you for further instructions and arrange an appointment for the car seller and buyer to come down to our office to sign all necessary documents. Is a personal guarantor a must? For In-house Car Loan, yes, a personal guarantor is a must. What documents are required to process the car loan application? Can we buy a used car through other companies and get car financing through Speed Credit? Yes, all car financing processing procedures will be the same. No, all applications are free. How much time will it take for my loan to be approved? Usually, it only takes 1 working day for a loan to be approved. For used car loan, you can start by completing our online used car loan form, once sent, our car finance specialist will call you for further instructions. For refinancing car loan, please contact your current finance company first to get your outstanding balance amount. Should your current finance company ask for the full settlement date, it should be one day before your installment is due. Once you already have your full settlement amount, please fill up our refinancing application form for a much faster processing. For other types of loan, please do fill up ourinquiry form and let us know more about the loan that you want apply for. 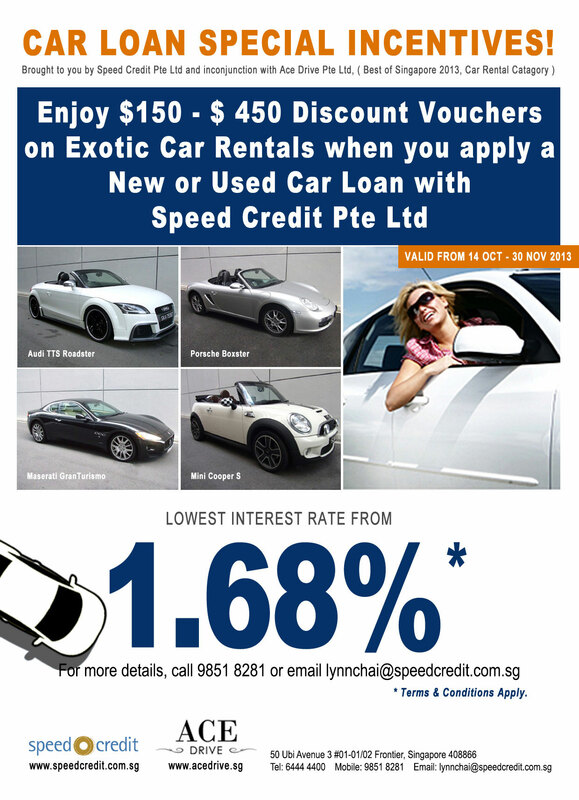 Alternatively, you can contact our car finance specialist, Lynn Chai at 9851 8281 for more information.